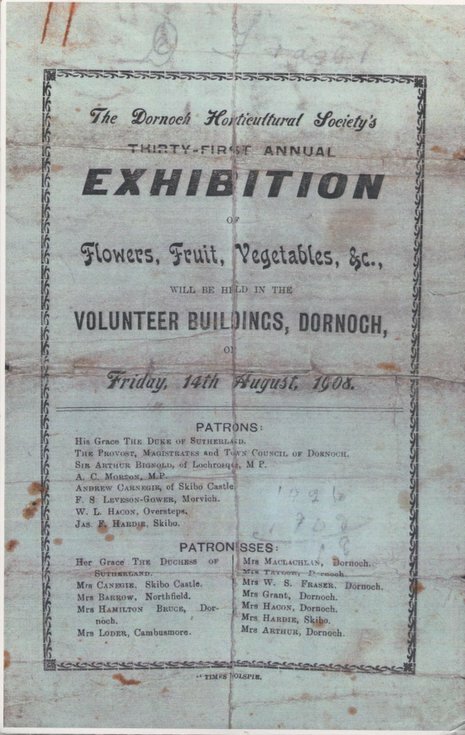 Poster advertising "The Dornoch Horticultural Society's thirty-first annual exhibition of flowers, fruit and vegetables etc. held in Volunteer Buildings, Dornoch, Friday 14th August, 1908" plus copy mounted on board. Poster is printed on green paper with black ornamental border. Includes list of patrons, including Duke of Sutherland, Andrew Carnegie, Mrs MacLauchlan and Mrs Loder, Cambusmore. original plus 2 copies, one photographic and one photocopied.